Last year I started The Flatstock Project as a PR and fundraising vehicle for The Center School, the high school my eldest child has attended for the past four years. Selling student poster art is definitely NOT going to spackle all our financial cracks, but every little bit helps. The Flatstock Project is my version of stone soup. Wyn Pottinger-Levy, Center’s Arts Integration Specialist/Graphic Design Instructor and I first talked about having students create posters a few years ago. I kept the idea in the back of my brain until Fall 2010 when I was perusing the parent volunteer sign-up sheets and saw the name Mike Strassburger, one of the principles at Modern Dog Design Company, on the list. Modern Dog is an internationally acclaimed design studio that is known for its bold and imaginative graphics. Their posters are so good someone even wrote a book about them. Did we get lucky or what? I contacted Mike Strassburger to explain the idea and ask if he would come talk to a group of students about what makes great posters great. Thankfully he said Yes. I next contacted The Vera Project – an all-ages music venue and recording facility in the NW rooms at the Seattle Center; part of The Center School’s “campus.” Since budding musicians need to advertise their shows, the Vera space includes a no-frills silkscreen shop for people to print their own gig posters and band fan-wear. After all, the art form now known as flatstock grew out of the advertising efforts of 90’s rock bands. Silkscreen printing is cheap, fast, and it’s possible to set up a workable print station next to the drum kit in your garage. Seattle has bragging rights to some of the most innovative and well-known of the early flatstock gig-poster artists, so I felt I was furthering a local artistic tradition. If you’ve gone to Bumbershoot the past few years, you may have visited the Seattle Flatstock Exhibit in the Flag Pavilion – one of four shows presented each year by The American Poster Institute (the others are in Austin, Chicago and Hamburg). For those looking for cool and affordable flat art, it’s a 2-D candy store, although many of the images nowadays have nothing to do with music. 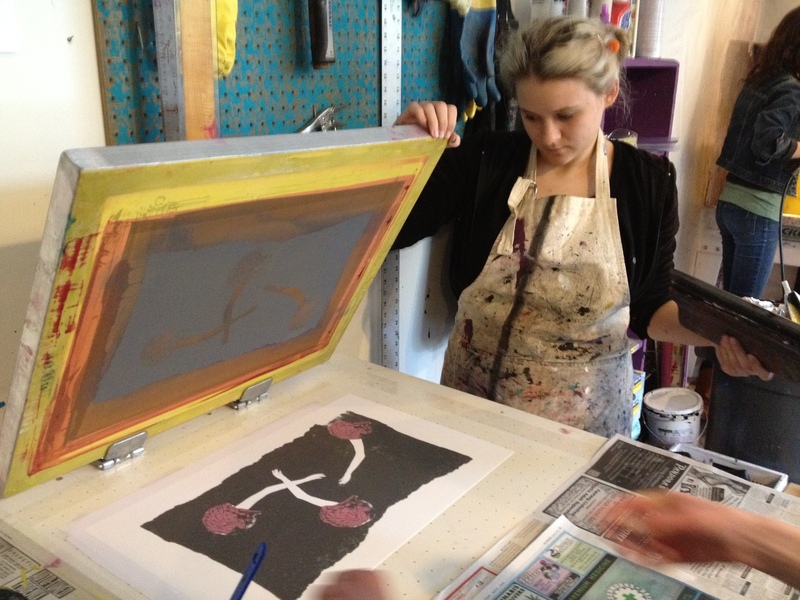 The Vera Project offers a Silkscreen 101 class for $25 which gives you the basic training you need to use their screen-printing equipment. 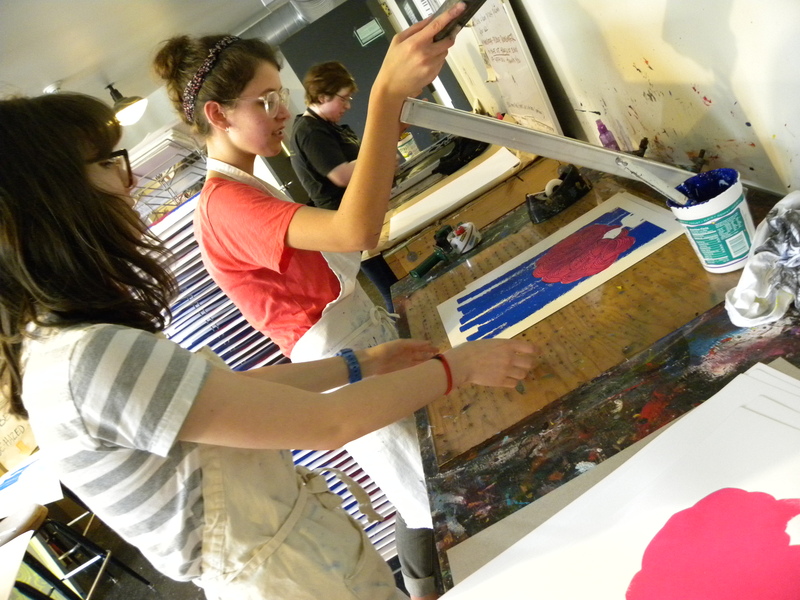 You can then sign up to use the print shop during one of their open sessions for only $7. Vera can look a bit intimidating if you are over 25 and not heavily inked and multiply pierced, but working with the people at Vera has been great. They are some of the coolest people around. Next I put together a proposal for the Center School Community Association (CSCA – Center’s version of PTSA) asking if they would cover the costs of creating the posters, which would then be sold at The Center School’s Arts Showcase – an end-of-the-school-year event where all forms of student art created in the past year are put on display. This includes arts-integration projects as well as photography, paintings and drawings from the visual arts classes, a screening of student films from the film department, and Center’s very own and eternally popular poetry slam. Why not take advantage of the situation and try and sell some student art to raise money for more student art? The art staff at Center recommended a small group of particularly talented and reliable students whom I invited to participate. During our first meeting, I had Rick Lorig, a friend and fellow flatstock enthusiast, come in and show off some of the prints from his collection as inspiration. By then I had a group of six students enthusiastic enough to follow the project through to completion and we went to Vera for our Silkscreen 101 class. The next session was with Mike Strassburger. Mike recommended that we choose a theme to work around and the group chose “MIND.” We continued to meet every week for a month or so to review and revise the designs until we were ready to print. Wyn Pottinger-Levy and parent/graphic designer Dinah Coops also dropped by for additional critical input. Once the designs were complete, we began scheduling printing sessions. Our screenprinting guide at Vera was the stalwart and ever-helpful Eric Carnell, the Vera silkscreen Committee Chair and owner of Independence Printage. Eric is a prince of a guy and pulls a mean squeegee. 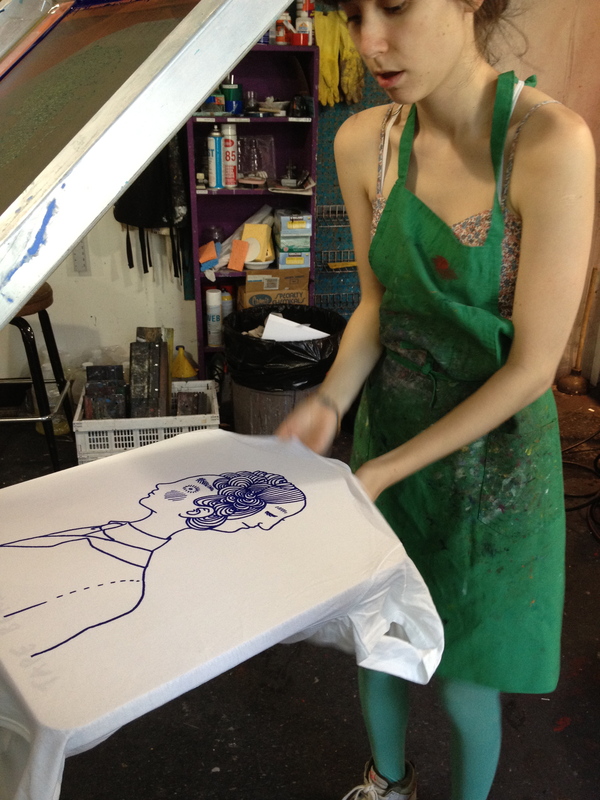 I’m not going to describe the whole silkscreening process. Let’s just say we had fun working up a sweat printing multiple colors on 50 sheets of paper for each design. 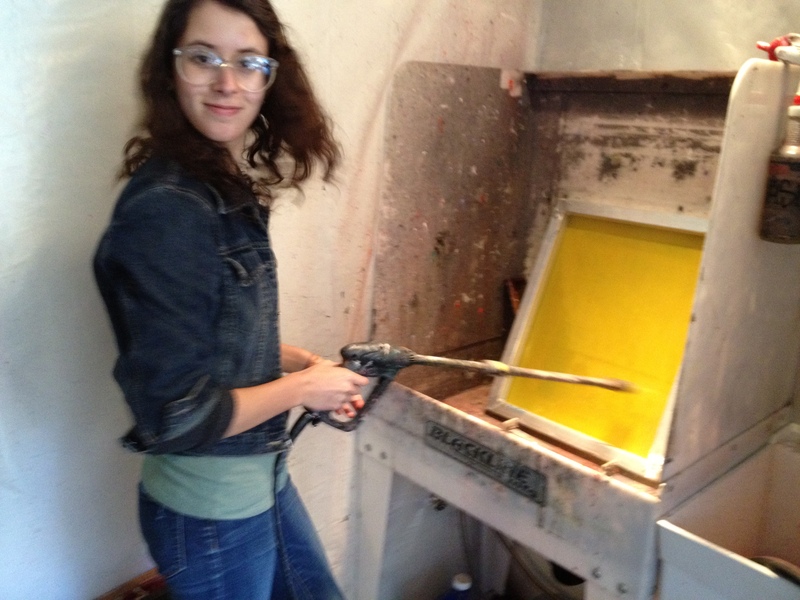 And don’t wear your best shoes to a silkscreen studio. We sold the prints, (limited editions signed by the artists) at the Arts Showcase last year as planned, paid for the whole project and raised nearly $500 beyond that. Well darned if I didn’t decide to do it again this year, upping the ante by signing up for a craft booth at the 2012 Northwest Folklife Festival, an event which takes place every year at the Seattle Center over Memorial Day weekend. Some of you may be wondering what the heck I’ve gotten myself into: working numerous hours for free to make a few hundred dollars of profit at a time. It’s not just about the money. It’s a self-sustaining applied arts class. Think of it as a work study prep program. There may be an ulterior motive if I delve a bit deeper. 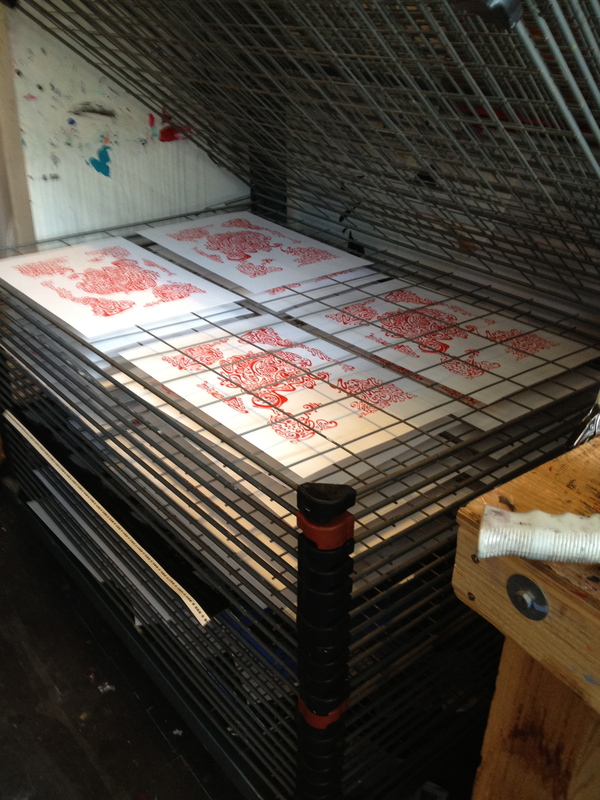 As a working artist and printmaker in the digital age, I love preaching the gospel of the print. How else can an artist produce an original piece of art, in multiple, while still maintaining hand-made integrity? 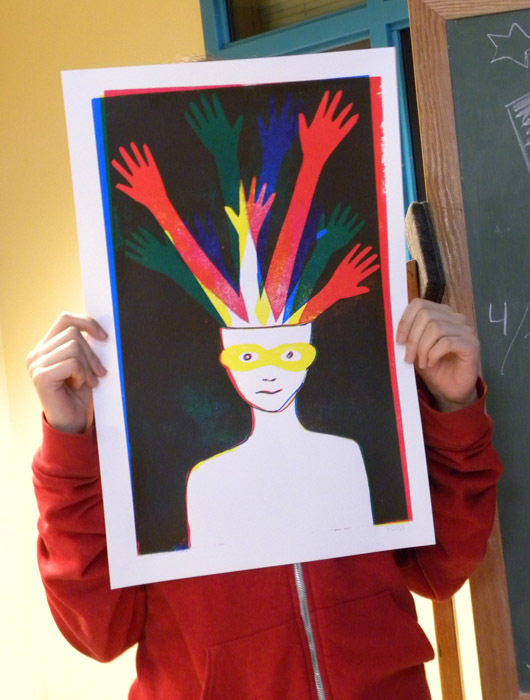 The students had opportunities to work in teams, learn a new art technique, explore a graphic design medium, develop a concept, communicate an idea visually, and promote and sell their work. Each student also gets to keep a few of their prints for their portfolios (or their mothers). Printmaking let’s you have your art cake and sell it too. And if anything will make you feel like there is hope for this world, it is working with young people who are learning to express themselves productively and creatively and don’t mind putting a little effort into it. Tomorrow night (June 7) from 6:00 to 9:00 is the Arts Showcase at The Center School. These are the posters and t-shirts that are for sale. Stop by and pick up some art for your wall or your wardrobe! This entry was posted in Art and learning, Arts advocacy, Fundraising and tagged arts and learning, arts enrichment, arts in public schools, arts inclusion, arts liaison, fundraising ideas for the arts, Pebbles In The Jar, student art examples, The Flatstock Project, The Vera Project. Bookmark the permalink. what a great project! congratulations to all concerned.